Text voting has been a huge success. We hope even more of you participate this year. Your votes will determine the People’s Choice award, the boat with the most votes overall will win. Each boat is assigned a number 1 through 30. 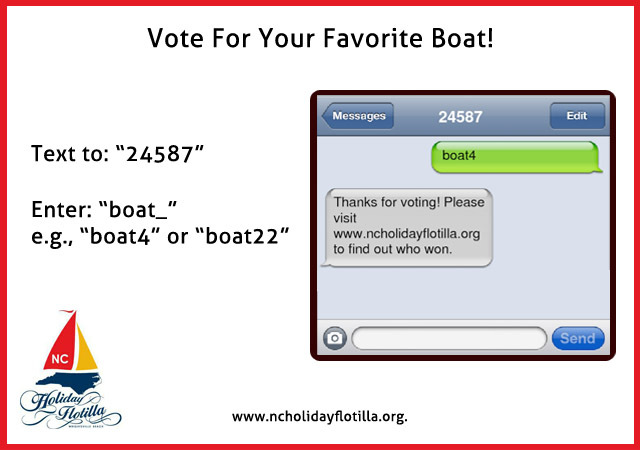 To vote, you add “boat” before the number and text it to “24587”. For example if you want to vote for boat #7 you would dial 24587 and type a text message that says “boat7”. We will then send you a text message confirming receipt of your vote. If you are a boat captain, make sure to get all your friends and family to vote. Text voting does NOT count before boat parade begins at 6pm Saturday.